Welcome to my review and video review for the Bright Therapy Trident beauty device. I am so happy with it and in being selected to try this wonderful tool. I love so many things about it and I do cover some of these in the video review but want to say them again in print. First thing I want to say is that I had been looking for and pricing LED Light devices. They are very pricey and you have to choose between what you want to treat and settle for that. I had seen these featured in magazines but the price was to steep for me. The Bright Therapy Trident is an great value because you don't have to choose between therapy's you get all 3 LED Light disks in the package. You will get a green disk for hyperpigmentation , a blue disk for treating the causes of acne and a red disk for treating fine lines and wrinkles. Each disk snaps into the unit with ease. I am using the green disk for hyperpigmentation for now and have been for 8 days because I do have some sun damage living in Florida. I can tell you that after 8 days I have seen a distinct difference in the darkness of these spots and they are getting way less noticeable. 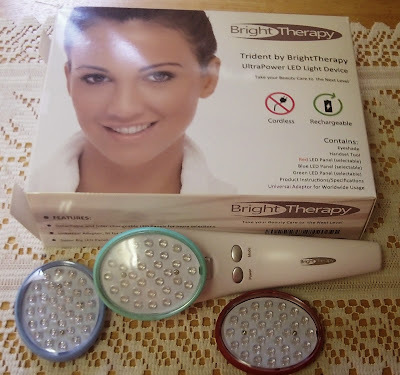 The Bright Therapy Trident has a lot of helpful features one being that it will beep once its finished treating the area so you can move on to the next area of the face or neck and you wont have to set a timer or keep looking at a clock. This is huge because you need to keep your eyes closed due to the intensity of the light or use the eye shield that come with the unit. Next thing I love is that I can use it with my skin care cream or serum and it will actually make it even more effective. This is a brief explanation on how to use the device. First wash your face and pat dry than select a skin care cream for let say skin lightning. start the unit and glide it over the first area of the face you are treating. The first kind of therapy is a pulsating light that flashes. This is done first and you divide the face into 3 areas for treatment. After this is finished the light on the device will stay constant you than treat your face and neck with the constant light changing areas as the unit beeps. I treat it every day and its fast easy and totally painless. There is also no down time for unsightly red spots or broken capillaries due to to much heat. This unit barley gets warm. Its is not drying, it dose not take a lot of time, its pleasant to use and works well. I have seen single devices like this one that cost up ward of 300.00 the Bright Therapy Trident device is just a bit over 100.00 and is shipped free through amazon. I will be using the red disk to treat my fine lines and wrinkles next. Some other features are its rechargeable, comes with an eye shield , is light weight and can be used with your favorite anti aging cream or serum. It charges really fast and you get more than one Treatment per charge. I hope you have a look at the video its a bit longer than my usual because I really wanted to get in what I love most about this device so you can make an informed decision. You can find the Bright Therapy Trident on amazon at this link and the video review below thanks for looking at my review.